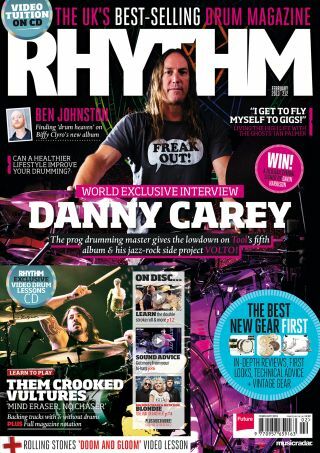 This month's Rhythm cover is graced by Tool powerhouse Danny Carey. We get the inside word on the rock titan's new album and hear all about Danny's jazz-rock side project Volto! We also have a nose around the drummer's frankly bonkers kit, talk to his two (yes two) drum techs and hear all about Danny's journey from a six-year-old Ringo Starr fan to the drumming behemoth that we all know today. PLUS: Check our 2013 gear preview for new kit from Natal, Mapex, Paiste. DW and many more! Nail Blondie classic 'One Way or Another', Them Crooked Vultures workout 'Mind Eraser, No Chaser' and Rolling Stones' newbie 'Doom and Gloom. Plus: Check out an exclusive with Ian Palmer, including a playalong track. All this and more in the December issue of Rhythm available now from all good newsagents, online or digitally from Apple Newsstand. Get yourself a copy from Apple Newsstand and enjoy all of our tuition content plus bonus videos, image galleries and other content.